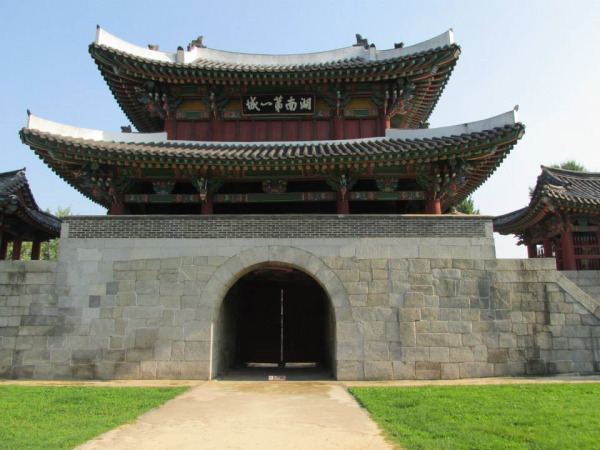 Before deciding on Jeonju, I had asked my Korean friends for recommendations on where to go for a weekend trip. I wanted somewhere close enough to Daegu, so that we would not be traveling all weekend, but somewhere that was completely different, so that we could experience something new. 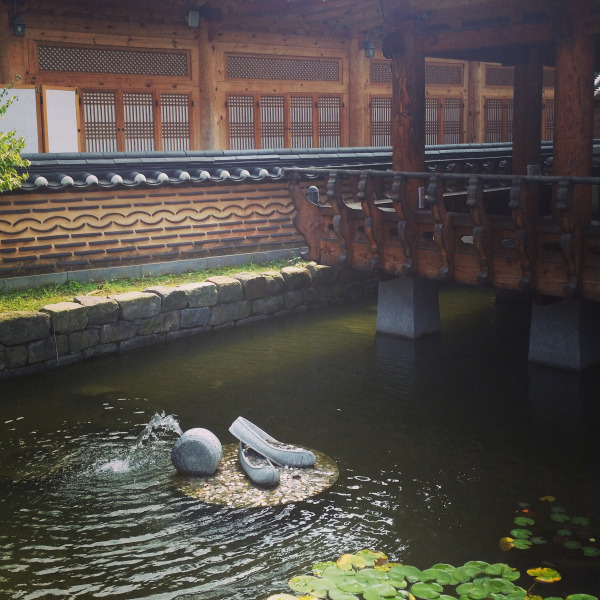 Jeonju was the perfect place. Within a few hours, we had our hotel and bus booked (Another thing I love about South Korea is that hotel prices are reasonable). We then booked our bus tickets online, which cost only $19 each way for the three-hour journey. “Long-distance” buses in South Korea are amazing. They are configured in a 2 – 1 seating position and recline with leg rests, making any journey really comfortable. 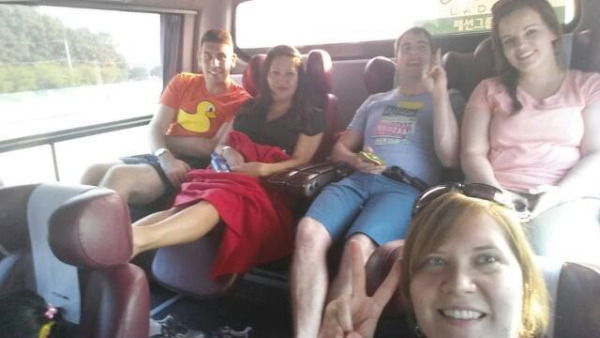 (Busses are luxurious in Korea). One of my favorite kinds was dolsot (meaning hot stone) bibimbap, which is served in a stone or metal bowl, which is really hot, which fries the rice. If you get a chance try this with a raw egg, and mix it well to make egg-fried rice, it’s really delicious. One other food that Jeonju is famous for is the choco-pie, (similar to moon pie). These were so tasty. We went to the famous PnB bakery, where people were lining up (always a good sign) for these famous baked goods. The wait was well worth it seeing that these were definitely the best choco-pies I have ever tasted. It was made with real cream, strawberry jam and chocolate and tasted almost like a European black forest cake. Each pie was only $1.30, which was great value, considering they were hand-made. 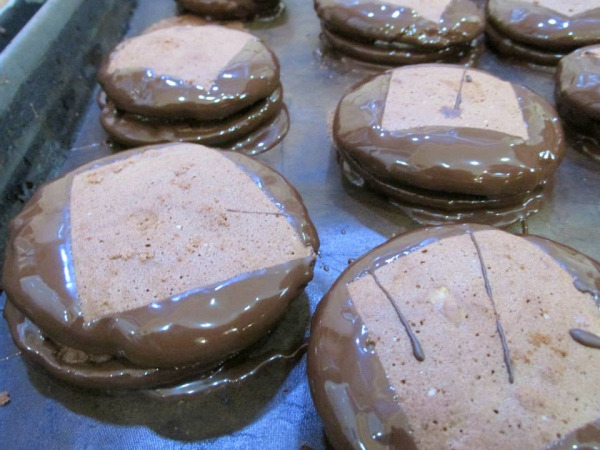 (PnB Bakery choco-pie's. So good). While we certainly enjoyed our food-filled weekend, we didn’t just visit Jeonju for Bibimbap or choco-pie. Jeonju is also home to one of South Korea’s largest Hanok villages, and certainly one of the prettiest. The weekend we went, turned out to be a festival weekend in Jeonju, so there were many events organized. 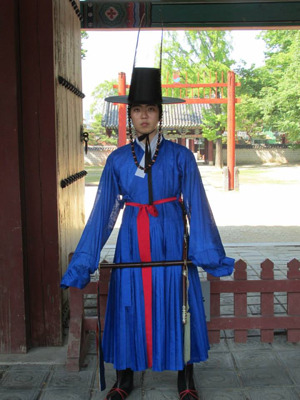 People were in Hanbok (traditional Korean clothing), there were English guided tours, museum exhibits and many other fun and interesting things to do. Like most things in South Korea (perhaps because it was a festival), they were free. 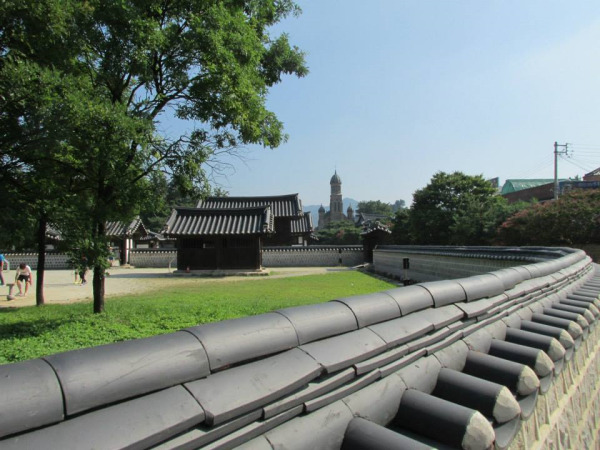 The local authorities in Jeonju had organized a photographer to take photos of people touring the palace, which was great, however, we assumed that they would simply email us the photograph. 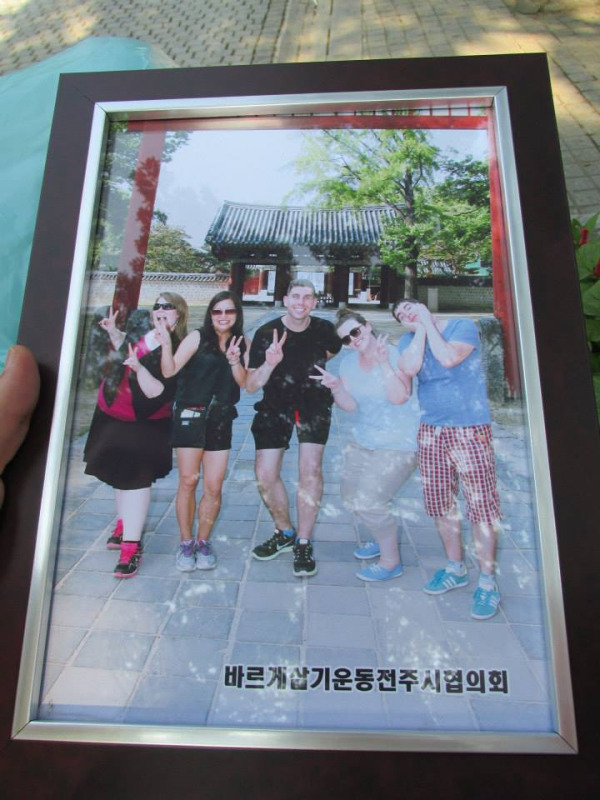 Not only did they print out the photograph, they also put it into a frame for us too. (Our free A4 sized framed photograph). While the Hanok village in Jeonju is sizable; it’s very easy to navigate around. 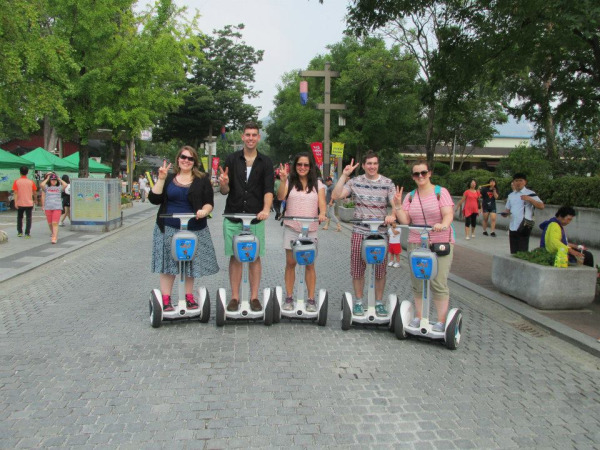 We decided to rent segways for an hour. They cost us $15 each, which was an amazing value. We went around the village, toured the famous sights and had great fun doing so. At first it was strange balancing, but after a couple of minutes of trial and error we were all flying around. It was definitely one of the highlights from our trip. Since moving to South Korea in 2013 I have visited many amazing towns and villages around this country, however, none have been as pretty as Jeonju. It really is a national treasure in South Korea. From the reasonably priced hotel, to our cheap bus tickets, not only was this weekend great value (costing less than $200 for everything, including all our food and drinks) the weather was perfect. It was warm without being too hot, ideal for touring this historic village and its many, many attractions. This was one of the nicest weekends I have spent in South Korea to-date. 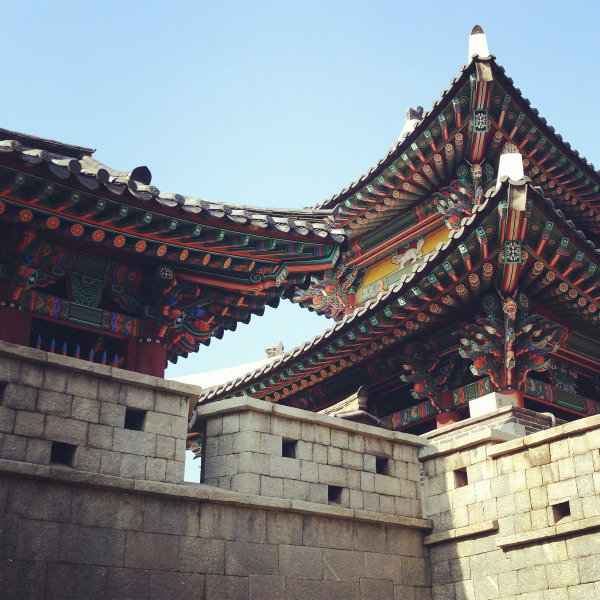 If you manage to make it to South Korea to teach English, then Jeonju is a must-see. John May grew up in Dublin, Ireland where he is from & went to Trinity College – one of Irelands best known universities. He graduated from here in November 2012 with a B.A. (Mod) in Geography & Sociology. John has always had a passion for travelling and having been to most of Europe, he decided to explore Asia after Uni. He has always wanted to teach and thought what better way to travel than teaching English on the way. John is currently teaching English for CDI in Daegu, South Korea a position he found through Aclipse; John felt nervous before his departure, but now that he is in Korea he loves every minute of it. For more information follow his blog.